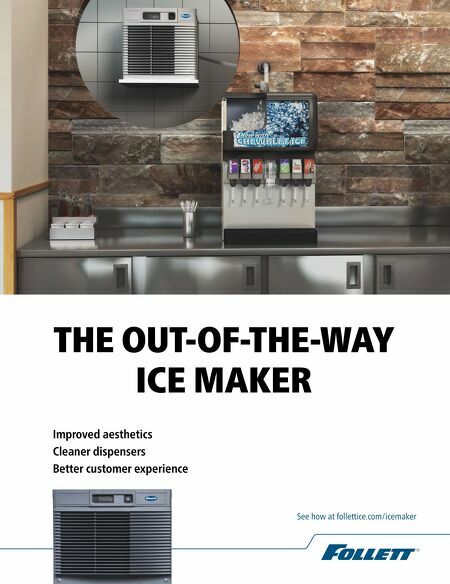 3" Curb 3" Curb 52 • FOODSERVICE EQUIPMENT & SUPPLIES • SEPTEMBER 2018 functional by design produce an operation's top-selling 40 drinks within easy reach. Achieving that level of functionality begins not with physical design, per se, but with careful consideration of concept and menu, both food and beverage. 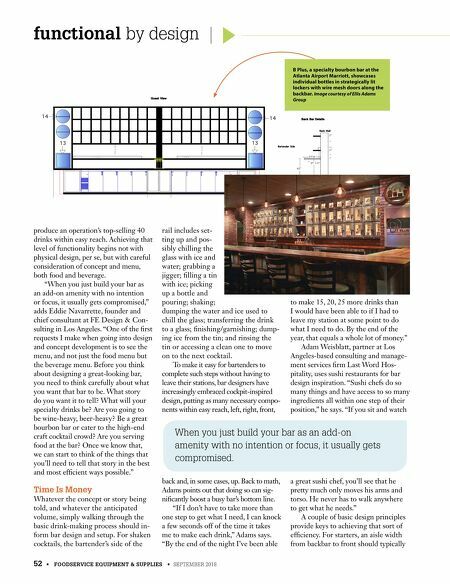 "When you just build your bar as an add-on amenity with no intention or focus, it usually gets compromised," adds Eddie Navarrette, founder and chief consultant at FE Design & Con- sulting in Los Angeles. "One of the first requests I make when going into design and concept development is to see the menu, and not just the food menu but the beverage menu. Before you think about designing a great-looking bar, you need to think carefully about what you want that bar to be. What story do you want it to tell? What will your specialty drinks be? Are you going to be wine-heavy, beer-heavy? Be a great bourbon bar or cater to the high-end craft cocktail crowd? Are you serving food at the bar? Once we know that, we can start to think of the things that you'll need to tell that story in the best and most efficient ways possible." Time Is Money Whatever the concept or story being told, and whatever the anticipated volume, simply walking through the basic drink-making process should in- form bar design and setup. For shaken cocktails, the bartender's side of the rail includes set- ting up and pos- sibly chilling the glass with ice and water; grabbing a jigger; filling a tin with ice; picking up a bottle and pouring; shaking; dumping the water and ice used to chill the glass; transferring the drink to a glass; finishing/garnishing; dump- ing ice from the tin; and rinsing the tin or accessing a clean one to move on to the next cocktail. To make it easy for bartenders to complete such steps without having to leave their stations, bar designers have increasingly embraced cockpit-inspired design, putting as many necessary compo- nents within easy reach, left, right, front, back and, in some cases, up. Back to math, Adams points out that doing so can sig- nificantly boost a busy bar's bottom line. "If I don't have to take more than one step to get what I need, I can knock a few seconds off of the time it takes me to make each drink," Adams says. "By the end of the night I've been able to make 15, 20, 25 more drinks than I would have been able to if I had to leave my station at some point to do what I need to do. By the end of the year, that equals a whole lot of money." Adam Weisblatt, partner at Los Angeles-based consulting and manage- ment services firm Last Word Hos- pitality, uses sushi restaurants for bar design inspiration. "Sushi chefs do so many things and have access to so many ingredients all within one step of their position," he says. "If you sit and watch a great sushi chef, you'll see that he pretty much only moves his arms and torso. He never has to walk anywhere to get what he needs." A couple of basic design principles provide keys to achieving that sort of efficiency. For starters, an aisle width from backbar to front should typically 1'6" 1'6" 11'4"l x 4h x 4d 11'4"l x 4h x 4d 13 13 G u e s t V i e w 14 14 B a r t e n d e r S i d e 37 1/2" 27"d B a c k W a l l B a c k B a r D e t a i l s 42" 1'6" 2" 2" 4" 1'0" B Plus, a specialty bourbon bar at the Atlanta Airport Marriott, showcases individual bottles in strategically lit lockers with wire mesh doors along the backbar. Image courtesy of Ellis Adams Group When you just build your bar as an add-on amenity with no intention or focus, it usually gets compromised.